Wednesday marks the 20th anniversary of the Canoe-In for Wilderness on Little Tupper Lake. 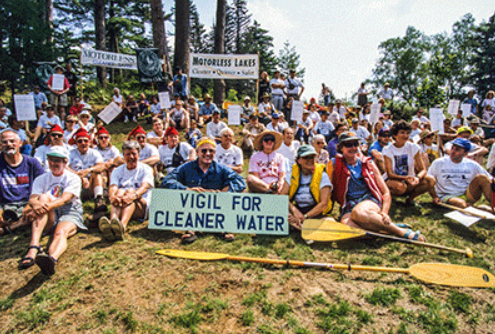 On August 15, 1998, over 300 people in over 200 canoes, kayaks, guide-boats, rowboats, and one small sailboat, rallied on the sloping lawns of the Whitney Headquarters on the shore of Little Tupper Lake and then paddled out onto the lake in a massive flotilla in the Canoe-In for Wilderness at Little Tupper Lake. This event was the biggest environmental rally in a very challenging and divisive time in Adirondack Park history. Those who gathered that day were unabashed in their support for a Wilderness classification for the newly purchased Little Tupper Lake. A number of important motorless waters were created in the years after the Canoe-In for Wilderness. In 1998, there had not been a major piece of land classified as Wilderness since the late 1980s when the Blue Ridge and West Canada Lake Wilderness Areas were expanded around Cedar River Flow. 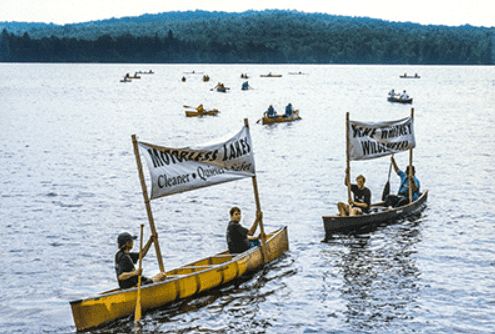 The Canoe-In for Wilderness was organized by a number of groups, such as the two precursors to Protect the Adirondacks – the Residents’ Committee to Protect the Adirondacks and the Association for the Protection of the Adirondacks – as well as the Atlantic Chapter of the Sierra Club and a group called Motorless Otsego. Pete and Ann Hornbeck of Hornbeck Boats helped organize the event as did guides like Kim and Ernie LaPairie from Blue Mountain Lake and Jamie Frasier from Adirondack Mountain and Stream Guide Service. Andy Mele, author of Polluting for Pleasure, also helped. Six months later, the Adirondack Park Agency voted to create the William C. Whitney Wilderness Area. This included most of Little Tupper Lake and upgraded Lake Lila from Primitive to Wilderness, some 16,000 acres in all. 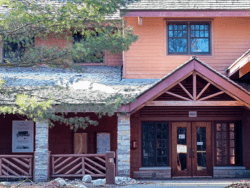 Jim Frenette of Tupper Lake, then an APA In-Park Board member from Franklin County, with the full support of the Pataki Administration, led these decisions by the APA. During the debate about the Little Tupper Lake decision, Frenette said that he wanted his grandchildren and their children to be able to paddle and camp on Little Tupper and enjoy it as Wilderness. 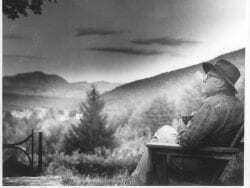 The Commissioner of the Department of Environmental Conservation (DEC) at that time was John Cahill, and he made the trip to Lake Placid for the APA meeting to personally cast his vote for Wilderness. The Little Tupper Lake classification spawned a series of new motorless waters across the Adirondacks and marked an active period for the creation of Wilderness lands and motorless waters. The years after the creation of the William C. Whitney Wilderness Area saw the creation of the Madawaska Flow-Quebec Brook Primitive Area (a future Wilderness area in waiting), the classification of Henderson Lake as Wilderness, the reclassification of Low’s Lake to Wilderness, classification of the Dead Creek Flow as Primitive, classifications of Bog Lake and Clear Pond as Wilderness, and motorless management of Thirteenth Lake, among other wildlands victories. These years also saw the creation of the Round Lake Wilderness Area and expansion of the Five Ponds Wilderness by more than 30,000 acres and near doubling in size of the Pepperbox Wilderness. Last week I went out with three friends to paddle from Little Tupper Lake to Lake Lila. We started at the Whitney Headquarters put-in and paddled all day 9.5 miles up Little Tupper Lake and the Rock Lake Outlet before reaching a beautiful campsite on an island on Rock Lake. The Rock River was a stunning meandering Adirondack river, with a series a beaver dams to climb over and one short carry. The next day we paddled across Rock Lake and carried our boats and gear along the 1.8-mile carry to reach Hardigan Pond. After a short paddle across Hardigan we carried our boats and gear again to the outlet of Big Salmon Lake and paddled downriver to Little Salmon Lake. Hopefully, one day paddlers will be able to paddle upriver to Big Salmon Lake, which is currently privately held as part of the 36,000-acre Whitney Park. The paddle into Little Salmon Lake was beautiful, the shores lined with white pines towering over a tight wall of spruce, balsam and tamarack trees. Kingfishers bobbed through the air along the riversides. A few beaver dams broke up the serenity. We camped that night at a site near the entrance to Little Salmon. At that point we were deep in the Forest Preserve, far from public roads and motorboats, though we were near the boundary lines of the private Brandreth and Whitney Parks, which are crisscrossed with private dirt roads. The next morning we paddled across Little Salmon Lake and carried to Lilypad Pond. At Lilypad, one has the choice of another carry to the Shingle Shanty River or to paddle around the mug handle through Brandreth Park where the Lilypad Pond Outlet meets the Shingle Shanty River and flows into Lake Lila. This paddle through Brandreth Park remains in litigation with a trial going on now to develop a factual basis for the courts to render a decision. The public right of navigation, involving former Adirondack Explorer editor Phil Brown, has been upheld at the State Supreme Court level and at the Appellate Division, Third Department, but was ordered to trial to develop a factual history by the Court of Appeals, the state’s highest court. The Shingle Shanty River is one of the most beautiful in the Adirondacks. The last few miles before it enters Lake Lila transition from a river running through a forest to a river meandering through an alder swamp. The river vegetation was in high bloom in the first week of August with abundant Cardinal flowers, towering purple Joe Pye weed, white bulbs of Spirea, clusters of purple Pickerelweed, and masses of White and Yellow Water Lilies. We camped on the east side of Lake Lila that night and carried our boats out at the Lake Lila put-in the next morning. The trip from Little Tupper Lake to Lake Lila is somewhere around 22-26 miles total depending on whether one carries or paddles out of Lilypad Pond and where one pitches their tent on Lake Lila. We leapfrogged with an energetic group of young campers from North Country Camps the whole way. 20 years ago this trip was impossible, but today it is open and accessible and it’s a great gift to the public. Intrepid paddlers can even push on from Lake Lila by carrying up the railroad tracks to reach Clear Pond, Bog Lake and Low’s Lake, and then carry to the Oswegatchie and Robinson Rivers, a 60-mile trip that has some long carries but also takes one through a dozen amazing places that would be hard to get to otherwise. Many people and organizations, too many to name, helped to preserve these vast tracts of land over generations that made this experience possible, a bipartisan, multi-generational, and public-private effort, and I am grateful to them all. August 15, 1998 was an effective day of protest. 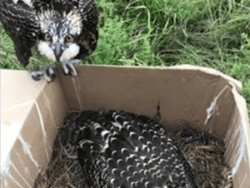 The importance of such actions grows greater each year as wild places grow more scarce. The Adirondack Park offers great opportunities for hiking to wild places, where the longer one hikes the more remote the country one can access, but opportunities to do this by boat are limited. The Oswegatchie River provides such an opportunity, as does the Cedar River Flow, especially if you want to carry a boat south to more distant Cedar Lakes. Little Tupper Lake and Low’s Lake now stand as great entrance-ways to wild areas. For many, canoe or kayak access is how they get to wild places and enjoy Wilderness. While much has been gained over the last two decades greater opportunities are needed for more motorless waters in the Adirondack Park. Great now how do you stop rural destruction by wind turbines.? This primitive area is like 6000 acres, are we planning on allowing parcels smaller than 10K to be designated wilderness? Very sad to read yet another article that mentions the scarcity of large, remote bodies of water in the Adirondacks. I wonder what would have happened if 20 years ago if these groups advocated for half the wildness Little Tupper Lake deserves (and got)? There’s a strong argument that the Boreas Ponds got a better deal than Little Tupper Lake. There are three inholdings (two with motorboats) on Little Tupper whereas the Boreas Ponds are completely protected within Wilderness and Primitive classifications, its watershed protected in Wilderness, and it’s part of a 271,000-acre Wilderness area. Little Tupper smacks up against a paved road. To my personal disappoint we’re at a low historic low in the management of the Forest Preserve today, much worse off than 20 years ago, in terms of the vision for Forest Preserve of our governor and the dismal states of the APA and DEC. So, in the wake of the Boreas decision, that you know I will defend as the best we could get given the political realities or our time and place, here are some things to consider. You could put your prodigious gifts into changing the minds of local government leaders on Wilderness in the Park. These folks have the governor’s ear and they were advocating for something far different at Boreas than what came to be. Or, you could work to rebuild the APA, which openly subverts state land policy by making Forest Preserve decisions based on political whims and not science and has joyfully relinquished its statutory independence and oversight. Or, you could work to rebuild the DEC, which tramples on the APA to direct what questions are asked and what information is gathered, works to weaken the State Land Master Plan, and makes its decisions based on public recreation and not on natural resource protection. Or, you could get us a different governor, perhaps somebody who actually hikes in the Forest Preserve as opposed to somebody who enjoys his corvette, big motorboats and snowmobiles. Or, you could articulate a vision for a Wilderness system in the Adirondacks where you draw lines on maps and then set to work to build support for your case in a way that makes it happen. Or, you can troll me. signal is just only beneficial to one particular match, when you overlook that tournament anyone overlook your option. So how many people showed up on Weller this weekend?